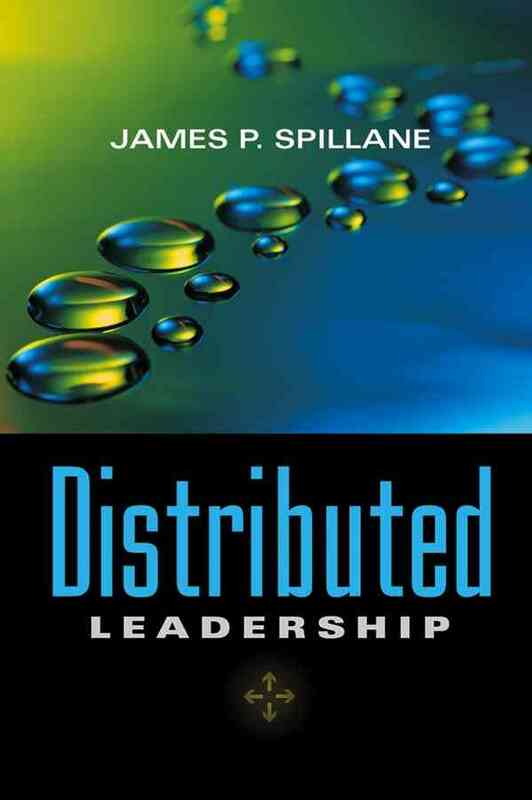 Distributed Leadership : What is it about ? and thirdly, that varieties of expertise are distributed across the many, not the few." Thus, distributed leadership is represented as dynamic, relational, inclusive, collaborative and as such integral part of a co-creative organizational culture. Distributed Leadership : Why would you use it ? 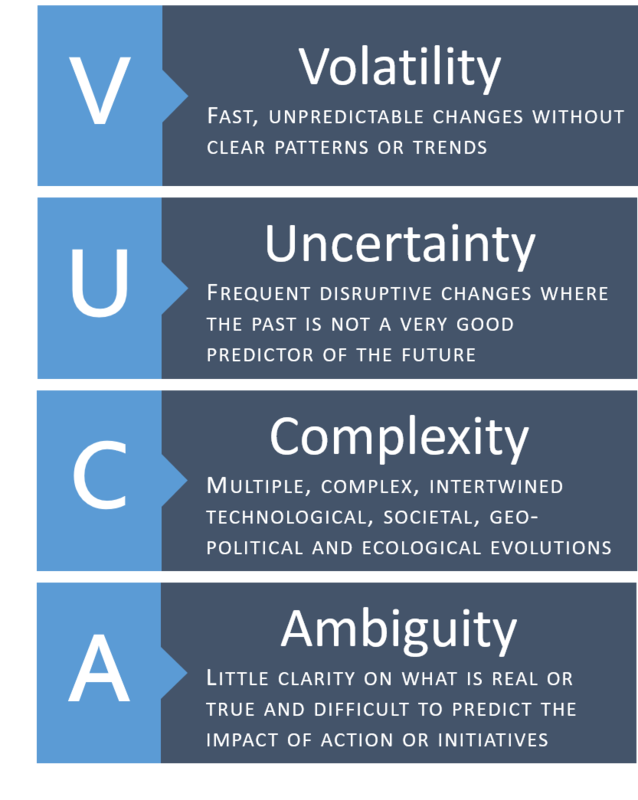 If we want to gear our organizations for sustainable performance in a Vuca world a top down, control and command leadership focusing on orders and communication towards the troops, is not effective. In a complex and knowledge driven organization the C-suite is simply not able anymore to make the right strategic decisions. The issues are too complex, the context too volatile and the necessary energy, expertise and creativity to do something about it too dispersed. Sense quickly the cues for change in the external context, swift and creative reactions to the environmental changes and challenges needs co-creation, constructive dialogue, collaboration, of different kind of professionals. Distributed leadership, where people see the issues, relate to others to discuss possible solutions and take swift action without being ordered by the board... that's what you need in such a context. The act of 'taking leadership' for the organization is reinforcing the idea that 'this is my club', I co-own it and what happens here is my responsibility. The speed of reaction in the organization goes up, because people look all out for 'new challenges' and issues and act upon them instead of starting a lengthy analysis and decision making process (up and down the silos). If you report a problem, you follow through on it. It develops individual and collective leadership competencies that make the organization as a whole more collaborative, agile and capable of change. It creates 'healthy jobs' with a lot of space for development, autonomy, self-regulation and at the same time co-creation that leads to shared purpose (The way all those distributed leadership initiatives stay aligned). How distributed leadership unleashes energy and creates performance is shown in "Zo werkt het Niet". 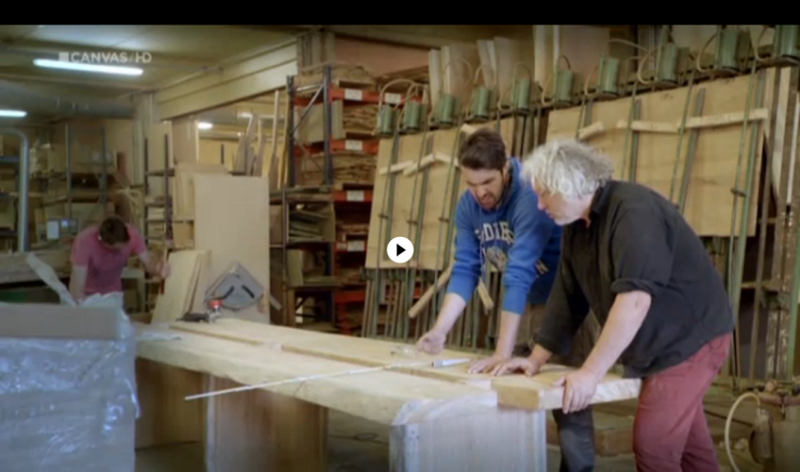 ("This is not the way it works" a documentary made by VRT-Canvas, Flemish Television with examples of GoreTex, Favi, Poult, Harley Davidson, etc... (in Dutch / partly in French, English & German with Dutch subtitles). 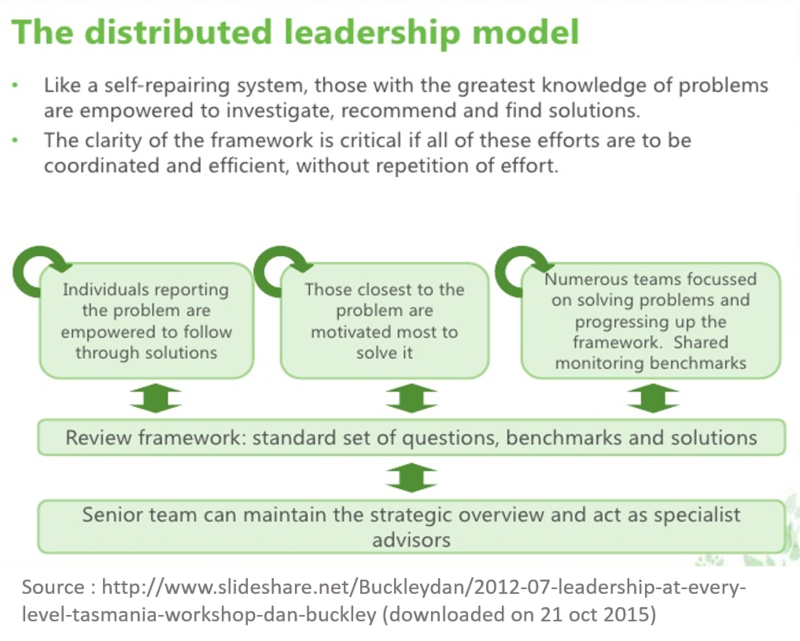 Distributed Leadership : When to use it ? 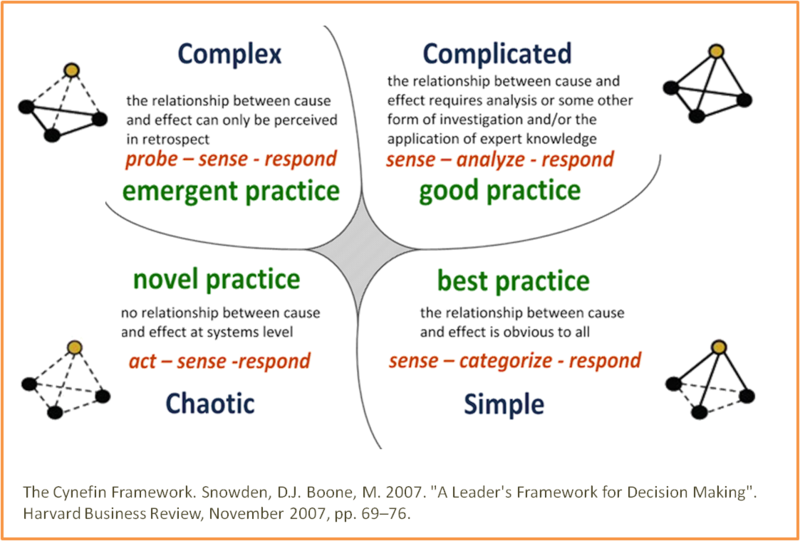 Using the Cynefin framework can help executives sense which context they are in so that they can not only make better decisions but also avoid the problems that arise when their preferred management style causes them to make mistakes. Since the complex domain is much more prevalent in the business world than most leaders realize - and requires different, often counterintuitive, responses - distributed leadership and co-creative processes work better then command and control, because the 'right answers' and 'telling people what to do' don't exist any more. And a leader who cannot know what the answer is, better refrains from 'ordering people' to do things in a certain way. It's a recipe for failure. More on complexity and leadership in this article : Lichtenstein,B. et al., (2006), Complexity leadership theory: An interactive perspective on leading in complex adaptive systems E:CO Issue Vol. 8 No. 4. Distributed Leadership : How can Move! support organizations ? In practice the evolution of mechanistic organizations with vertical command and control leadership towards a flexible, learning organization based on participation, co-creation and distributed, integrative leadership, proves to be very hard. It is a profound, cultural change process in which we need to let go of our 'precast' thinking about leadership. 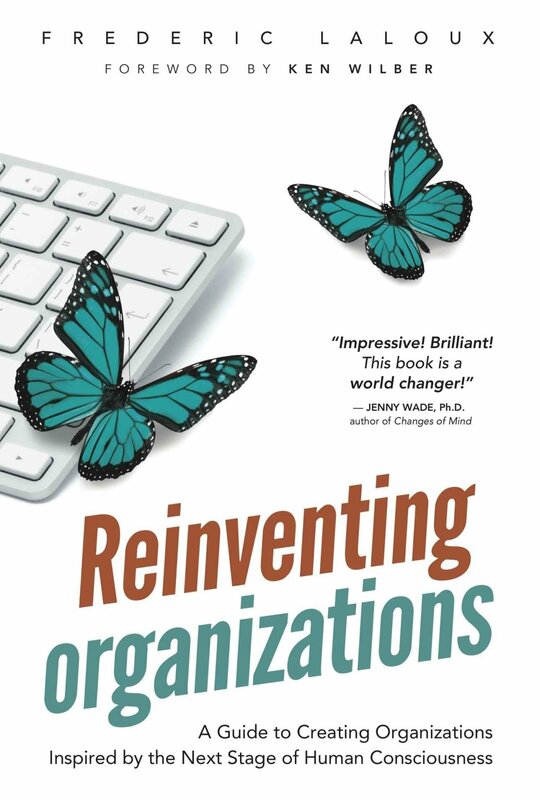 It is a fundamental re-engineering process of all aspects of organizational architecture. That doesn't mean of course that formal leaders and managers have no role to play anymore. To the contrary, their role shift (towards coaching and process facilitation) will be absolutely pivotal in that transformation. For more, read this article. 2.
we can help identify an appropriate 'clinch' to open the door of distributed leadership. That can be a specific team, or a change process or the strategic process in your organizations, a product development process or a specific problem the organization is having to deal with. It can also be a specific HR process : L&D, Talent Management, Performance Management that can be re-engineered towards co-creation, trust, autonomy and distributed leadership. we design and facilitate large group interventions to bring co-creation and distributed leadership in practice (as part of a community of practice for instance). we help stakeholders to look at their organizational culture and architecture to identify the hurdles for distributed leadership and work on a plan to remove those hurdles. we can coach people in formal leadership/management positions in transforming their role towards coaching and process facilitation away from 'command and control' towards trust and creating autonomy and self-management for teams and professionals. Do not turn it into a 'FETISH'. It's ok to still have formal leaders and managers, as long as they act in an enabling and facilitating way, creating for people the opportunities to take initiative, act on issues, etc...without blocking people's learning potential. Do not turn it into a aak er 'marketing and communication stunt' : Talk about how important it is to have everybody involved and in charge doesn't help (to the contrary it makes people pissed if they don't recognize that message in their real work). A few small steps in the direction of participation are often more powerful then 'well crafted vision statements'. Buurtzorg, an example to follow ? Interested in Distributed Leadership ? Marion B. Eberly, Michael D. Johnson, Morela Hernandez, and Bruce J. Avolio., (2013) An Integrative Process Model of Leadership Examining Loci, Mechanisms, and Event Cycles. American Psychologist. 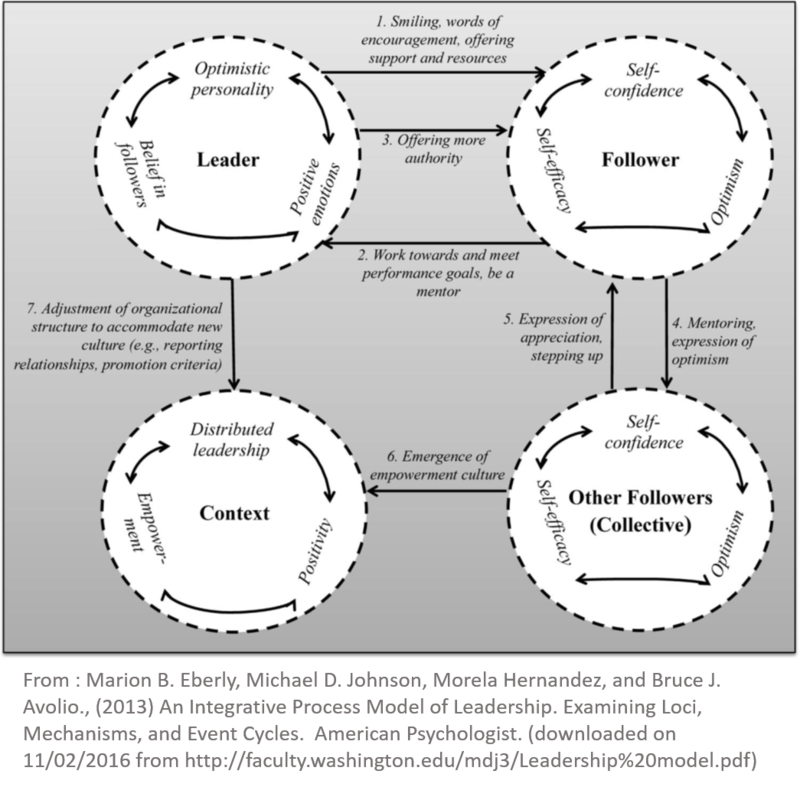 An Integrative Process Model of Leadership Examining Loci, Mechanisms, and Event Cycles.